I’ve completed my course in Coaching Skills and now I am an accredited (relational dynamic) coach! I will be looking for coaching opportunities with individuals, particularly writers and those working in the creative arts or in health care settings. It’s been an intensive time at the Free Word Centre in London working with a wonderful group led by excellent trainers, Deb Barnard and Anne Caldwell. I’ve been learning the theory, practising coaching with great enthusiasm, reflecting on what I’ve learned, and I’m so glad to have passed at the end! My head is spinning but I’m looking forward to developing my skills. I’ll be using my learning straight away with all those writers in the groups I lead. Another wonderful aspect of the course has been the help I’ve received with my own writing – through being coached by other members of the group. I’m fired up to get on with my novel. The first things is to count how many characters are milling about in it, just to check that there aren’t too many! When will I do this? Today! To link with the theme of some previous posts: this has been an emotional and intellectual journey for me – inspiring and challenging. Now I need to draw breath and sort out my ideas! The Saison Poetry Library at the Southbank Centre is a fantastic resource. You can visit it in person or online. If you are a poet, the list of poetry magazines is an extremely useful resource. You can browse through many issues online. A number of my poems are available to read for example, in South poetry magazine. 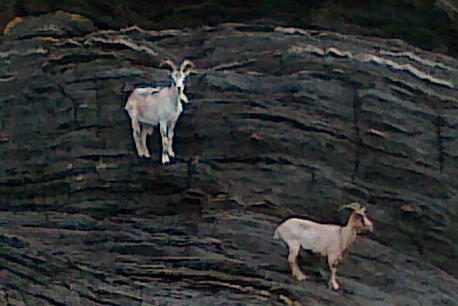 These goats clambered from grassland down the cliffs and onto a beach in Normandy. We were beachcombing – finding limpet and oyster shells, seaweed, a washed up camera bag and salty samphire – but the sight of these two intrepid animals was the best find! I’ve just returned from a holiday in Brittany, France where the weather was sunnier than here! 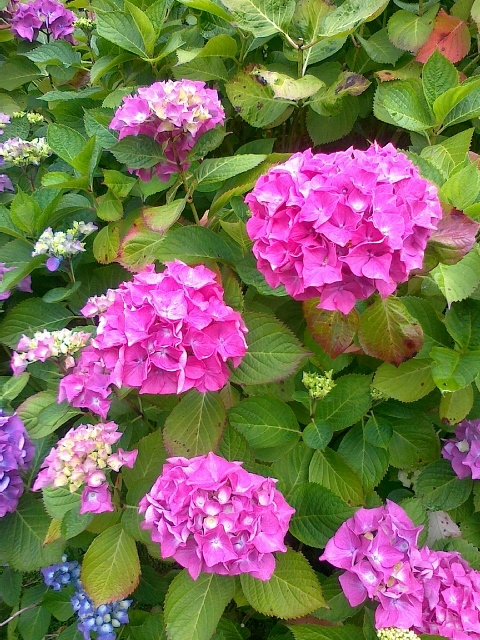 The hydrangeas were stunning and the washed sands and pink granite along the coast near Trebeurden were magical. Back to reality now. Next week I’m doing the second half of a course at the Free Word Centre in London. The course is an accredited Training in Coaching Skills for Writers (run by Nawe and Arvon) and I’m loving it. As well as sharpening up my coaching skills so that I can help other writers, it’s also helping me to sort out my ideas about my own writing. I’ll be saying some more about this course and the Free Word Centre soon. It had rained continuously, one of those days that never really get light. Harry searched through the bins and found a pack of crayfish sandwiches, only just out of its date, some mushy bananas and a flabby pizza. He wouldn’t starve. He settled down, sleeping bag rolled by his side, carrier bag tucked into the small of his back. It was too early to go to St Peter’s hostel. Best not to arrive before nine-thirty, slip straight into the bunk, avoid meaningless chat. He pulled up the hood on his skimpy anorak and leant back out of the rain. When queues formed outside the restaurants, he ambled over. Spare us a few bob for the night, enough for a cuppa, need to catch a bus to the night-shelter. He was rather ashamed of his whining voice – the result of decades on the streets. A youngish couple whisked past. ‘Don’t stop, Tania, they’re all the same,’ the man said. ‘But darling, we can give something,’ Tania said, flicking back her glossy hair and tugging at her man’s arm. He rustled through his pockets. He only had notes, that was clear. Harry waited, trying to look humble. Eventually Tania found a fifty-pence piece in her evening bag. He collected more money in this way and felt satisfied, even though he was sodden right through. He’d buy himself a proper coat at the charity shop tomorrow. Looking through the restaurant window he could see Tania and her man, in the candle light, eating yet another course. The man ordered a second bottle of wine. Then he bought a rose from the seller who, Harry knew, could sometimes get £5 for a single bloom. Tania took it out of the cellophane and tucked it behind her ear. Next time Harry looked, the couple were arguing. The man glowered at the waiter, paid the bill and they left. Harry stepped back into the office doorway. ‘I bought you a rose, didn’t I? What more do you want?’ he demanded. The rose lay in the drab gutter, its red petals glowing, raindrops sparkling like diamonds, under the street lamp. It looked so beautiful, Harry was minded to pick it up, but what would he do with it? And he could just hear the taunts he’d get at St Peter’s if he arrived with a poncy rose. The flower reminded him of his Nan. Hadn’t she loved roses? Didn’t she grow them in the front garden? Harry pictured himself, as a little lad, helping her feed their roots, water and prune them. Ouch! He remembered the thorns. In his mind’s eye, he buried his face into their enormous dewy heads, could feel their cool silkiness against his skin, smell their perfume. His Mum had inherited Nan’s love of roses. She’d kept a crumbling spray in a box at the bottom of her wardrobe, a reminder of her wedding day. It had stayed there even though Harry’s Dad had proved to be a far from perfect husband. Mum was a kind, generous person. He might have been able to return once Dad had died, if he’d kept in touch as a son should. But he’d never been back to Eskdale Villas, not since that day when he’d been unable to tell his parents that he’d got the sack, yet again. He’d neglected his mother for so long she’d not want to see him now. She wouldn’t recognise him, Harry realised, sadly. It didn’t do to dwell on the past, though. He had to keep positive to get through each day. Even so, being a little superstitious, he couldn’t leave the rose to get trampled on by uncaring feet. He rescued it and stowed it in his bag. As Harry trudged up the hill to the shelter, the idea came to him that he would buy one of those padded envelopes and send the rose to Mum. He hoped it would touch her heart. Next morning, as he munched cornflakes and drank a mug of weak tea, Harry unwrapped the flower. Of course, it was dead, the petals ragged and bruised. He’d been mad to think it would last over night without water. Like everything else in his life it had disintegrated. Harry broke its stalk, scooped the petals off the table and chucked the whole lot in the bin. ‘You all right?’ asked a young bloke with dreadlocks. ‘Yeah, mate, fantastic,’ Harry replied. It had been a big thing, planning to send the rose to Mum, and he’d been thwarted. That was just typical of his life. He never got anywhere. But, somehow, Harry couldn’t abandon his idea. ‘I hope you are well,’ he wrote on the postcard. On the reverse was a stunning photograph of the town’s rose-garden. ‘These roses reminded me of you.’ His hands were so stiff and his handwriting enormous, so that was all he could fit on it, along with his mother’s name and address. The card and postage cost him a pound but he didn’t begrudge it. Sending it, trying to make contact with her, eased his mind. Of course he didn’t hear anything back. ‘You can’t trust the post these days,’ he grumbled over breakfast, and then wished he hadn’t as he had to explain. He felt stupid – he hadn’t given an address, hadn’t really considered that his mother would now be well over eighty. ‘Your Mum’s maybe moved, maybe she’s …’ Harry knew what the dreadlocks bloke meant. ‘Thanks, mate, thanks,’ Harry said, gratefully, his heart lurching and pounding. He picked up his few belongings and set off up the hill to the night-shelter. Prize-winning story at Winchester Writers’ Conference and published first in ‘Crumbs on the Table’ anthology.